Water soluble special purpose acrylic undercoat, available in brown and black colors, and suitable for creating patina styles. It constitutes part of a system together with the acrylic varnish DECOLUX combined with the metallic pigments LUSSO D’ORO. Distinguished for its unique endurance and its strong bonding ability on a wide range of surfaces (marble and gypsum based plasters, wood, primed metal, ceramic, glass etc.). After curing for 24 hours, it is not affected when coated with solvent based varnishes. 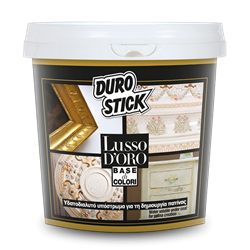 LUSSO D’ORO BASE DI COLORI successfully applies on painted or non painted wood or metal furniture, as well as picture frames, and wall surfaces made of drywall or cement board. Apply it also on interior decorative plaster ornaments and ceiling rosettes as well as decorative crown moldings made from polystyrene, wood or plaster. Decorate with it ceramic or cement statues, glass bottles and ceramic pots etc.